​ we'll let you know if a spot opens up. 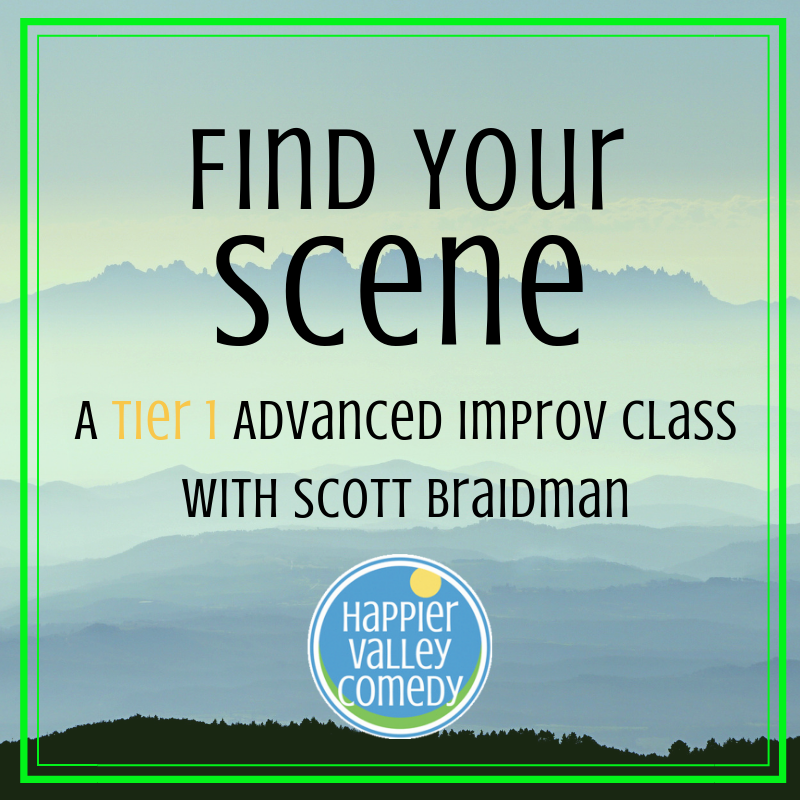 "Find Your Scene is a helpful class for even experienced improvisers. You relearn skills and lessons you may have forgotten and you have an opportunity to see yourself in a new way. If you allow yourself to open your mind and challenge your usual way of doing improv, you can take yourself to a new level." "In real life, you repeat a class if you fail. In improv life, you can repeat a class just to have more fun! 'Find your Scene' is one of those classes that you could take it again and again, layering your developing skills and playing with a new grouping of people each time. It is a core course for practicing small scenes, working with environment, working with characters and emotion, and doing object work. And it’s just plain fun!" Ready to take your scenework to the next level? Have you ever felt lost in a scene? Ever felt like you were running out of steam? Not sure what the best next move might be to keep the magic flowing? We'll practice some key concepts and tools that propel you into fun, successful scenework, including game of the scene, mapping, heightening, and reinvesting in your own moves. The focus is on skills to use during your scene that will help you find solid footing. Not only is "Find Your Scene" the first step for new Advanced Improv students to get more comfortable with scenework before moving into learning improv structures, it's also the best class for veteran students to retake again (and again!) in order to bolster and polish their own performance. "Find Your Scene" is both the first and next step for Advanced Improv students to get in those vital reps! Whether it's the first, second, or third time in the class, all levels of students are grateful for Find Your Scene! This class is now full. Put your name on the waitlist below.